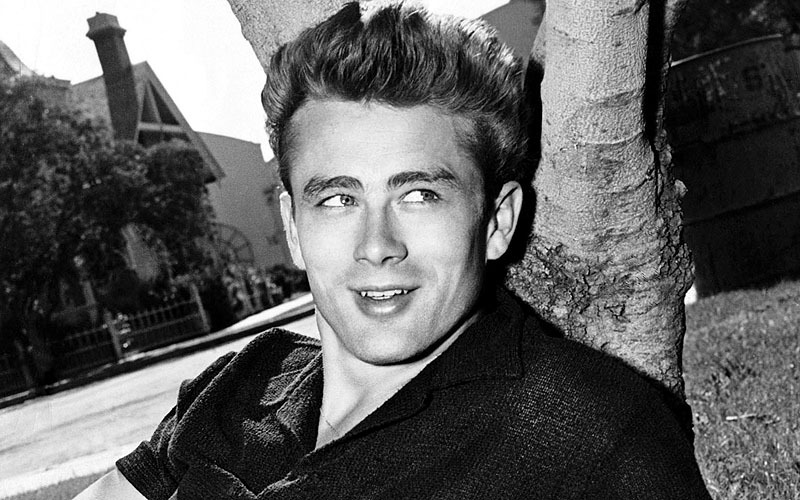 James Dean died on September 30, 1955. He was driving his new Porsche Spyder from Hollywood up to Salinas for a car race when he was killed in a crash. He was just 24 years old. It might seem a bit morbid, but on this tragic anniversary (and as a huge fan of his work, particularly his exquisitely sad turn in “East of Eden”), here are some of the places he frequented while living here in Los Angeles. A lot has changed since then, but the history of LA and the legacy of James Dean live on. 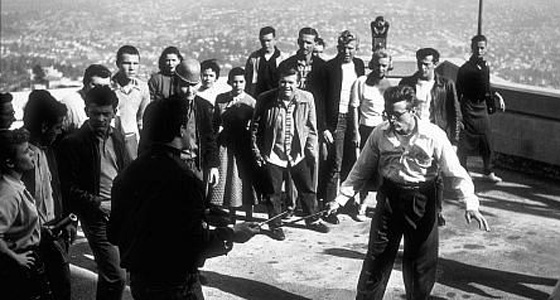 Even if you’ve never seen the entire movie, you definitely know the knife-fight scene from “Rebel Without a Cause” that was filmed right in front of the Griffith Park Observatory. Outside near the main lawn is where you can find a large bronze bust of James Dean (which, by the way, aesthetically doesn’t do him the least bit of justice) atop a white column commemorating the iconic film which he never got to see. It was released less than a month after his death. Looking at it today, you’d never know that the monstrous Laemmle’s Sunset 5 megaplex with Crunch Gym, CB2 and Trader Joe’s was once the site of Schwab’s (the most famous drugstore/diner/soda fountain in America) and Googies coffee shop, two of James Dean’s most frequent haunts. Both of these places were ground zero for writers, actors and other industry types and on any given day (or night) there was a very good chance you’d find Dean hanging out. Back in its heydey, Ciro’s was probably the most famous hangout for A-listers of the 40s, 50s and early 60s. James Dean had been to this Sunset Strip nightclub on numerous occasions, including one month before his fatal crash. It became the Comedy Store in 1972. To this day there are stories that the ghosts of celebs past still haunt the space, although I’ve never heard that Dean is among the dead who taunt the living. James Dean’s favorite restaurant, Villa Capri, no longer exists, but the food lives on at Patsy’s Pizza located in the Original Farmers Market. Dean would often eat alone in Villa Capri’s kitchen away from the Hollywood crowd and is rumored to have eaten his last supper there the night before he died. (In fact, at the time of his death, Dean had been renting a home in Sherman Oaks from the maitre d’ at Villa Capri.) The restaurant belonged to Patsy D’Amore, who is credited with introducing the very first pizza to Los Angeles. D’Amore’s daughter Filomena uses the same recipe used in the original antique brick oven. If you want to eat the way James Dean did, this is the place to do it. Before leaving for the 300-or-so mile-long trip to Salinas (located along the Central Coast in California), Dean filled up his tiny car at a gas station located at 14325 Ventura Boulevard in Sherman Oaks. The original plan was to tow the Porsche in the station wagon (notice it with the attached trailer behind Dean in the photo above), but Dean decided to put some pre-racing mileage on the car. The location is now a flower shop, but the service island where Dean was photographed still remains after 56 years. The now defunct Touch of Romance flower shop on Ventura Blvd. operated from the vintage glass office of the 1959 Chevron gas station, Casa de Petrol. The sleek, modern Casa de Petrol structure had been constructed on the site of a previous, 1940s-era Mobilgas station. 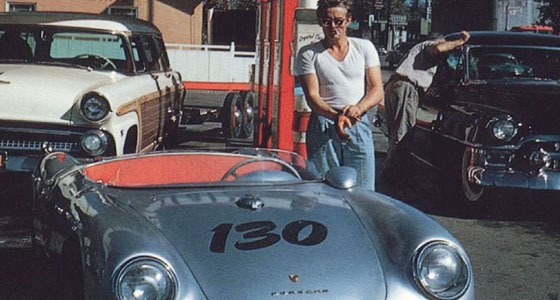 It was at the earlier Mobilgas station where Dean was photographed with his Porsche Spyder on 9/30/55. The busy intersection of Ventura Blvd. and Tyrone Ave. was widened in late 1950s and most of the tiny Mobilgas station property was lost, including the pump island behind Dean in the famous “last gas” photograph. The new Casa de Petrol pump islands were very similar in design but stood almost 100′ east of the old Mobilgas pump island. Is there a record of the places he’s lived at in CA? Unfortunately, ‘A Touch of Romance’ is no longer there. The whole place, including the four pillars you can see behind Dean and his Porsche on the photo, has been completely raised a few months ago. Such a shame as the flower store was also the one in ‘Six Feet Under’. He didn’t take the coastal route; he was inland and took highway 46 back toward Salinas, which is the road he died on. 9-30-55. Mar Yvette is one of the few contemporary writers who has gotten all the James Dean historical facts exactly right! The photo of Dean standing next to his 550 Porsche Spyder was taken at the Mobil station which is located at Beverly Glen and Ventura Blvd. in Sherman Oaks. It was taken with Dean’s own Leica 35mm camera by his mechanic, Rolf Wutherich at approximately 2 pm PST on 9-30-55. Wow, thanks for your comment, Lee! You have provided us all with such great insight about Dean and his fascination with cars (and motorcycles). Great interview with Jay Leno, by the way! James Dean is my DREAM!!!! Cool almost ended 56 years ago today. There have been a lot of guys after the title, but Jimmy was–and is–the king of cool. Nice story — and pix. Thanks! I haven’t seen any of his movies, but he sure had great taste in automobiles. I would love to have that porsche. What a bummer he died in it.